For the first year ever we followed a consistant science program in our homeschool. I think the main reason we were able to stick with something for the course of the school year is that we teamed up with three other families and created a science co-op. Once a month we would gather at someone's house to review chapters and complete experiments. This held all of use accountable and ensured that the kids were getting the most out of their science experience. The book that we chose was Apologia's Exploring Creations with Human Anatomy and Physiology. Every family owned a copy of the book and purchased a Notebooking Journal for each child. For me, these notebooking journals were what sold the program. They were so vital to the learning process and a very creative way to store and display all the different projects and activities. The text was sometimes very technical, so I would have to pick and choose what to read and what to paraphrase. I loved the book extras that Apologia supplies. They are internet sites and on-line activities that correspond to the learning. Isaac shows off his model of the brain made out of play-doh. We also loved all the "Try It" activities. They were usually hands-on and an excellent way to expand on the material being presented. My boys got so much more out of the reading when it was followed up by some sort of physical representation. In order to make the notebooking journals as effective as possible, I would scour the internet before teaching science to the boys and print pictures for them to paste into the notebooks. I wanted the notebooks to be a visual reference for them to look back to, and I knew if I had them draw and label ever cell, brain parts, and nervous system development that the notebook would look like a big mess. I also tore out the coloring sheets in the Junior Notebook and gave them to Margaret to color. My boys just aren't into coloring sheets. That was all well and fun, but if this had been the extent of our science education than we would have stopped science in September. The really great part was the co-op. One of the moms leads a review during science co-op. Sometimes more intense "Try It" activities were part of the co-op. At the end of each chapter was a longer experiment and these were often done as a group at co-op. Henry works on creating a cell out of jello and candy. Many times the activities we completed as a group were not found in the book. We used the book as a reference for what to study, and the internet and other supplements to create our science day. How many breaths will it take James to get the car to the top? Our balloon model of how the lungs work. Getting to explore the inside of a real cow heart. One of the end-of chapter experiments was to participate in a science fair. This was perfect because my kids enter the homeschool science fair every year. Anyone who knows my boys will know that they had had enough of anatomy and physiology by the time the science came around. They wanted to do something different. So we took a break from the subject material and let the boys do a science fair project on whatever subject they chose. Isn't that a main reason why homeschooling is so great? It allows you the freedom to explore interests even when they are different from the subject matter. Overall this was the best year of science we have ever had. Both the Apologia curriculum and the commitment with the science co-op made it a success! This post was written as part of a blog-hop over at My Joy-Filled Life. She has asked numerous homeschoolers who use Apologia Science to link up a post. 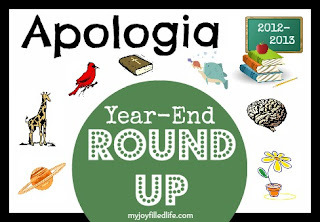 Head on over and see if Apologia Science would be an interest for your family. Click here to visit My Joy-Filled Life.